Yesterday, I took my daughter and a friend to see the highly anticipated LEGO Batman Movie. Well, at least it was highly anticipated by me! So without further ado, here is my LEGO Batman Movie Review. LEGO Batman Movie Review – 4 1/2 Batarangs! While it’s not as good as the original LEGO Movie, it is still very good in its own right. The original was just so… original. It will forever hold a special place in my heart. The LEGO Batman Movie is just… different. And that’s not bad! This is a great movie. It is a fun movie. There is a ton of action. And there are tons of characters. And I was very happy to see that the LEGO Batman Movie sets are perfect replicas of the vehicles featured in the movie. I reviewed the Joker Notorious Lowrider recently, and it is the same for sure. I won’t have to modify them at all for my town displays. The LEGO Batman Movie was not what I was expecting, but now that I think of it, I don’t know what I was expecting. While it’s a little more straight forward plot wise than the LEGO Movie, there is a twist I didn’t see coming. It’s not like the twist involving Emmet and the Man Upstairs, but it surprised me none the less. Another thing I really appreciated was the way the movie pays homage to every Batman I’ve ever seen. We see inspiration from Adam West, George Clooney, Christian Bale. We see inspiration from the 60s TV series, the movies form the 90s, and the Dark Knight trilogy. You see a lot of stuff packed into this flick! 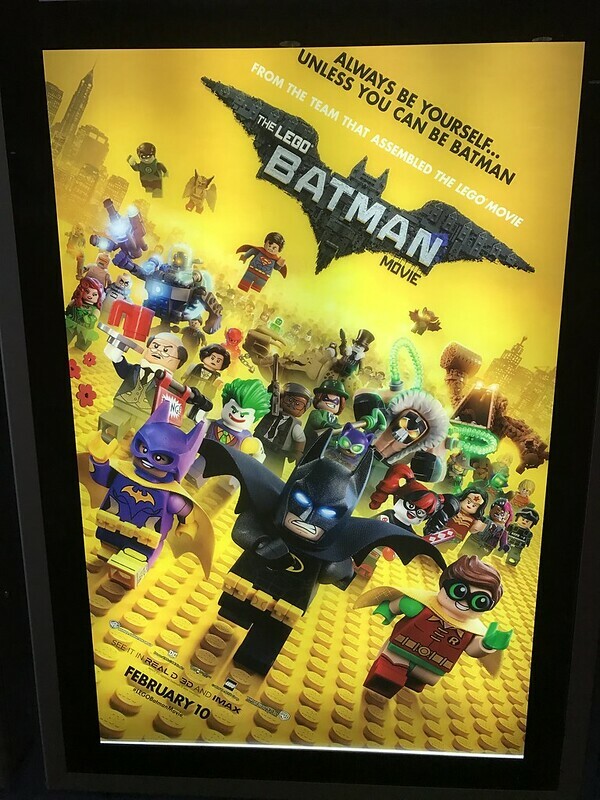 I definitely recommend going to see it if you’re a fan of LEGO, or a fan of Batman. I’d love to hear your LEGO Batman Movie Review! Leave me a comment below, and let me know what you thought! Now I did like the movie! It was fast-paced, fun and clever. – The amount of characters was overwhelming sometimes, it almost feels like they wanted to put so many minifigs in there for the merchandising (I am a little Lego-batman (merchandising) tired though.). Many of them didn’t really had a function in the story but were in minifig collectable series for example. – It was a bit too fast-paced for my taste, it could’ve used a bit more slow parts. – Al though the movie was fun and very light… the movie on screen was so dark… I don’t mean the mood, I actually mean the darkness on screen. All in all, double feelings, but overall positive. I also loved the Lego-movie more, more light, more balanced, more fun. Despite my little annoyances, I really liked the batman-movie though and I’d recommend it to others. I agree with everything you said. There had to be well over 100 named characters in the movie. So much potential for so many great minifigures! And it was a bit fast paced. I would have liked a little more story.